I’ll start with a local Windsor artist – Allison Mistakidis, and aloraflora jewelry. 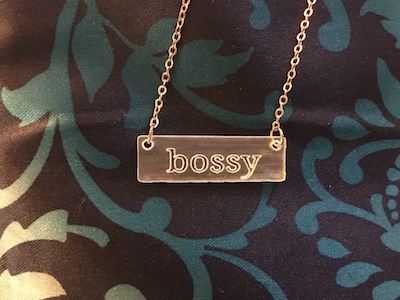 Allison is a UWindsor grad, and wears many hats – she’s a research assistant, college instructor, fitness instructor, Evidence for Democracy representative, and makes lovely jewelry (some science-related, along with other types)! I have a few of her pieces, including one of her earliest 3-D printed necklace designs. Another Windsor artist, Jodi Green, owns and operates Levigator Press. 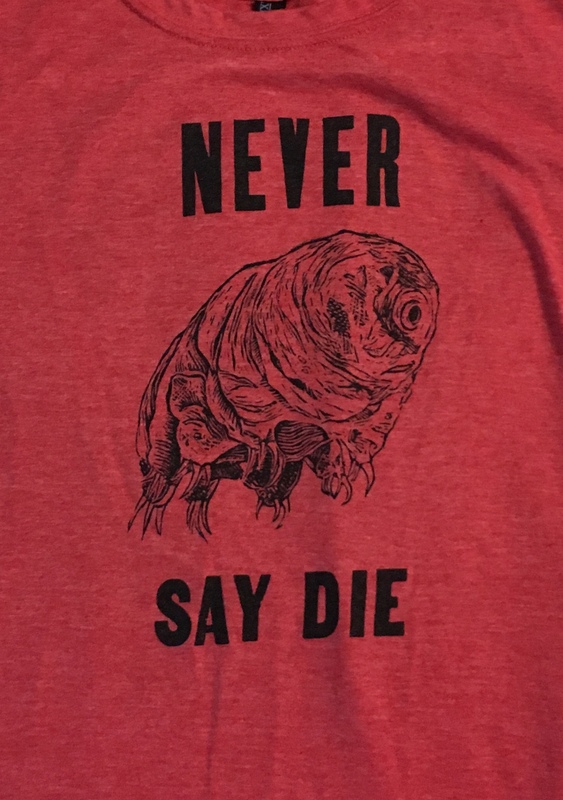 There are prints, notebooks, and printed clothing items available – I have her “Never Say Die” tardigrade print on a t-shirt (right). She also makes items featuring dinosaurs, plants, and other cool stuff. Levigator Press also holds classes and workshops, if you want to learn how to print or bind books. Self-described “marine geophysicist-printmaker, or vice versa” in Toronto, Ele Willoughby (minouette on Etsy) also makes prints (and pillows, etc. 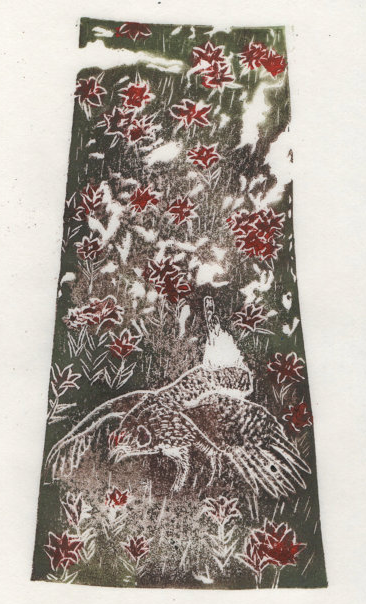 with her prints), many with a focus on science and the natural world. 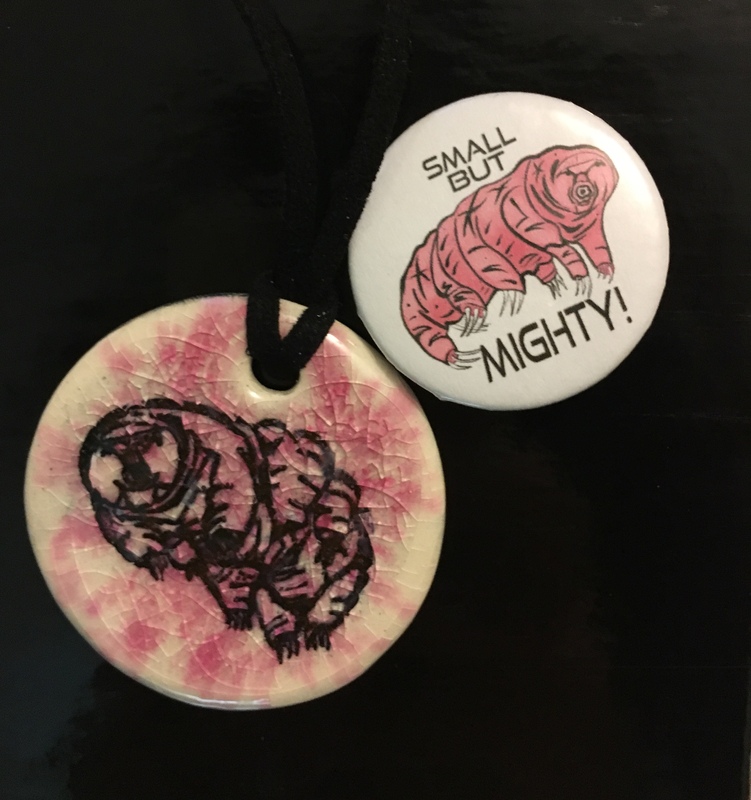 Her tardigrade print is one of my favourite pieces (yes, I am a sucker for those hardy little critters! ), and I also love her new series of the Canadian provinces/territories (of which I own a small portion). 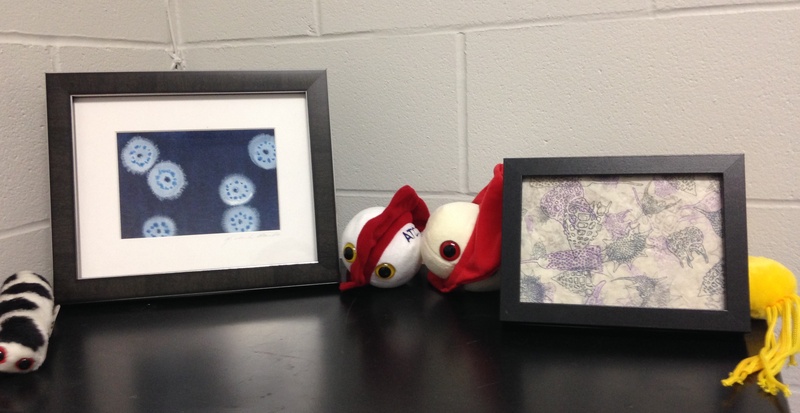 Nicole Edmond is a Calgary-based print artist whose art features the microbial world, and I have a lovely multi-layered radiolarian print (see image at the top of the page) and Paramecium magnet. 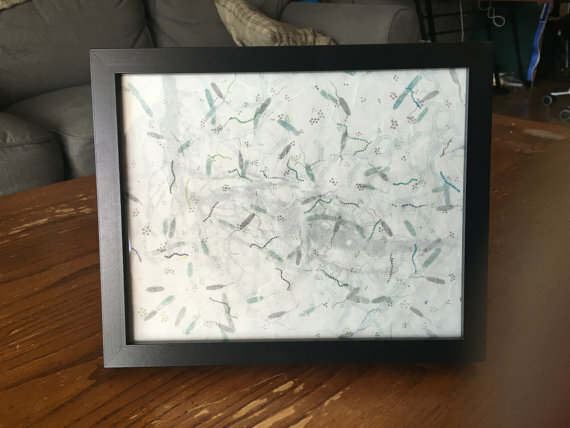 She also took on the challenge of creating a rhizosphere print (with bacteria), and made something even more beautiful than I had imagined. (The rhizosphere is the region in the soil immediately surrounding plant roots, containing plant secretions/root exudates, and lots of plant-associated microbes. It’s where the action is, soil-wise!) Check out her website to see some more of her work! 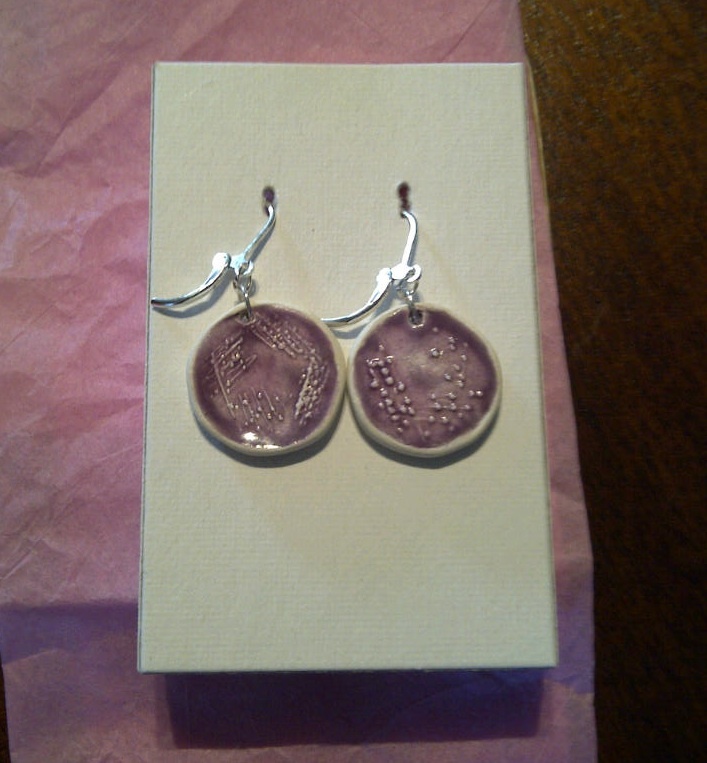 At this point, I think I can be considered a collector of ceramic jewelry (and clothing) by Toronto scientist and artist Peggy Muddles (theVexedMuddler Etsy site). So many cool, sciencey things (with lots of microbiology-themed items)! She also makes science-themed clothing, postcards, stickers, and probably many other things I haven’t yet come across. “Surly” Amy Davis Roth has helped feed my apparent addictions with tardigrades (via a ceramic necklace … and some buttons). Her SurlyAmy Etsy store also has a range of jewelry, pins, stickers, etc. with various themes, including (but not limited to) science and rational thinking (and some adorable robots). If you’re someone (or know someone) who enjoys colouring, she sells cool colouring posters. Michele Banks (artologica Etsy site) is another amazing artist. 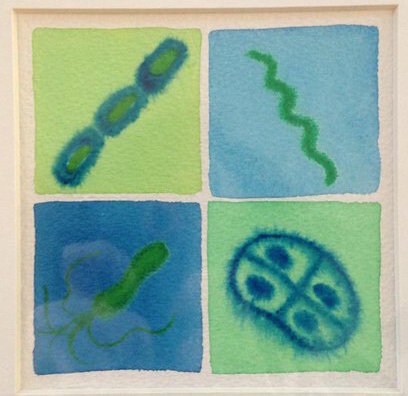 A Streptomyces watercolour painting by Michele was my first ever Etsy purchase (see top of the page for a picture of that), and I was the recipient of a kind gift of a custom-ordered painting featuring some of my all-time favourite bacteria, shown here. I also have a couple of her scarves … and as I was just browsing her store, I see there are a bunch of new scarf designs, along with several new paintings! I don’t think I can really do justice to all of these wonderful artists here (and most of the pics were taken by me – i.e., not by a photographer! ), but I hope you’ll check out their work yourself! I know there are many other talented science artists out there, too, who I haven’t yet come across/mentioned here. Who else would you recommend?